Robbie Blake says his first impressions of the Rocks squad are excellent. The former Bradford and Burnley striker is the new first-team coach at Nyewood Lane and ran the rule over his charges for the first time on Monday. They look like they’re in good shape, which is really important. We had a couple of trailists in for the first session and doubtless we’ll have various other lads coming and going as the weeks go by. 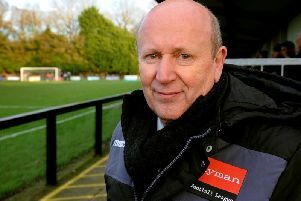 Blake will lead three sessions a week at East Dean FC, where the Rocks train, until pre-season friendlies begin, when it will come down to two a week. There were around a dozen players at the opening get-together and Blake said his first impressions were of a group of players who had kept themselves in shape during the summer and looked hungry to be successful in the season ahead. Bognor have so far persuaded ten of last season’s squad to rejoin for the 2018-19 campaign in the Bostik premier, although have so far added only one new face – ex-Worthing left-sided utility player Harvey Sparks. Returning from last season’s squad are defenders Corey Heath, Keaton Wood, Chad Field and Calvin Davies, utility player Harvey Whyte, midfielders Tommy Block, Doug Tuck and Tommy Scutt and forward Jimmy Muitt. But moving on from Nyewood Lane to other Bostik premier clubs have been full-back James Crane and striker Ollie Pearce, who have gone to Worthing, centre-half Gary Charman, who has signed for Burgess Hill, and former captain Sami El-Abd, who has joined the Dorking revolution. Blake, who has joined Bognor after a spell as first-team coach at Pompey, told the Observer: “We had a very good start to pre-season on Monday night. “I introduced myself and started to get to know the players. Blake said he was a coach who liked to mix fitness and ball work, rather than keeping the two separate. Blake said sessions would aim to step up players sharpness so the squad were ready for the pre-season tests to come. Two of these come against professsional clubs early on, with Brighton under-23s visiting on Tuesday, July 17, and a Pompey XI at Nyewood Lane a week later. Manager Pearce said efforts to bring in more players were continuing – but were not proving easy. He said: “Training was fine and the lads looked in good shape which is always encouraging. “At this time of year, it’s always a question of patience when you are looking to recruit new players. “Holidays don’t help either with players you have and those you want often away. The Bostik premier campaign starts on Saturday, August 11 and the fixtures are due out a fortnight today.